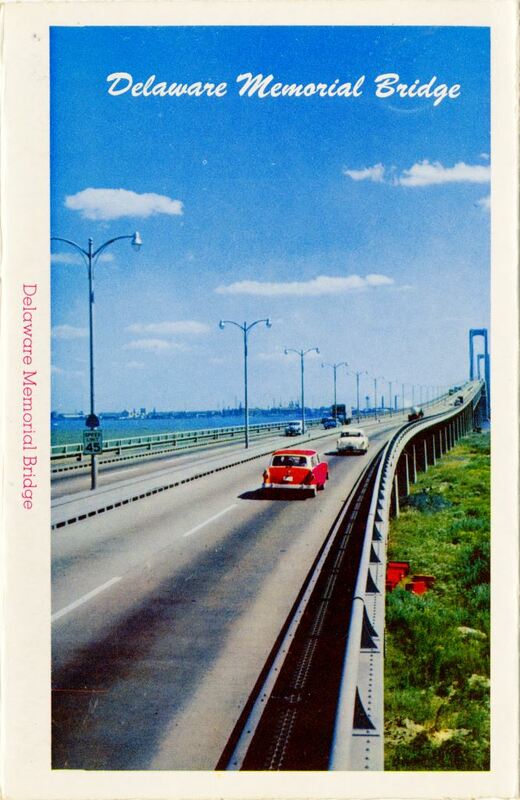 A postcard depicting the Delaware Memorial Bridge, which connects the Delaware Turnpike in New Castle, Delaware, to the New Jersey Turnpike in Pennsville Township, New Jersey. The bridge opened its eastbound lanes in 1951 and its westbound lanes in 1968. Originally published by the Howard Johnson Publishing Department. "What Exit? New Jersey and its Turnpike." The New Jersey Historical Society. http://www.jerseyhistory.org/exhibits/turnpike.html. 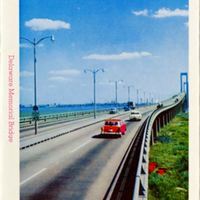 “Delaware Memorial Bridge Postcard.” RICHES of Central Florida accessed April 20, 2019, https://richesmi.cah.ucf.edu/omeka/items/show/6718.